In a truly inspiring instance of perseverance through pure failure and godawful struggles, 12th-ranked Cincinnati basketball scored only 15 points in the first half, yet still won their game against UCF tonight. The Bearcats came, uh, “roaring” back with a staggering 34(!) second-half points, while holding the Knights to just 19 in each period, which was good enough for a 49-38 win. I swear, that’s a basketball score, but if you have any memory of UCF’s 51-23 football win (in which they didn’t even play the fourth quarter) over Cincinnati this season, I can’t blame you for not believing me. If you’re wondering how this monstrosity could possibly happen, well, some of it was by design. Out of 351 teams, Cincinnati plays with the 291st slowest tempo in college basketball, while UCF is even more sluggish at 303rd. But a lot of it is just inexcusably bad shooting. Cincinnati went 19-of-53 from the field, while UCF was even worse at 15-for-50, in a stat that might disprove the classic slump-breaker’s “just keep shooting” mantra. 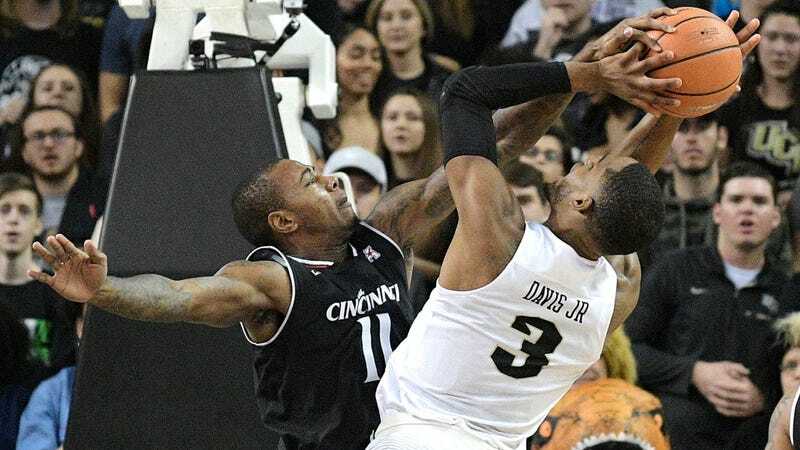 Nobody on UCF got more than seven points, while the only bright spot on the Bearcats was senior Gary Clark, who notched a double-double with 17 points and 14 boards. Most spectacularly, Clark actually shot more the 50 percent on the night. 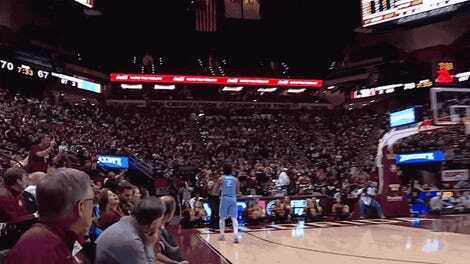 The most thrilling part of this game was the roller coaster on UCF’s floor, but to avoid bumming everyone out, here is a good alley-oop finish from Clark, who truly didn’t deserve all the ugliness around him.